For other Captain Marvel characters, see Captain Marvel. Captain Marvel (Mar-Vell) is a fictional superhero appearing in American comic books published by Marvel Comics. The character was created by writer-editor Stan Lee and designed by artist Gene Colan and first appeared in Marvel Super-Heroes #12 (December 1967). Captain Marvel #29 (November 1973). The character debuted during the Silver Age of comic books and has made many appearances since then, including a self-titled series and the second volume of the Marvel Spotlight series. Captain Marvel was ranked 24th in IGN's list of "The Top 50 Avengers" and has appeared in television series and video games. A re-imagined version of the character portrayed by Annette Bening appears in the Marvel Cinematic Universe film Captain Marvel (2019), which depicts Mar-Vell as a female Kree scientist who adopts the alias Dr. Wendy Lawson. From 1940 to 1953 Fawcett Comics published comics featuring their popular character Captain Marvel, and thus held the trademark to the name "Captain Marvel". Fawcett ceased publishing the comics in 1953 due to a 1951 copyright infringement suit from DC Comics, and their trademark ostensibly lapsed. Taking advantage of this situation, Marvel debuted its new Captain Marvel character in 1967 and quickly trademarked the name. Marvel was not the first company to try to capitalize on Fawcett's lapsed trademark; in 1966 the small publisher M. F. Enterprises released a short-lived Captain Marvel series. Due to the title containing its company name, Marvel had convinced M.F. Enterprises to cease their Captain Marvel series after five issues, paying M.F. a settlement of $4,500. Marvel's character debuted as the lead feature in Marvel Super-Heroes #12 (December 1967), written by Stan Lee and illustrated by Gene Colan. Although usually credited as co-creator, Colan had no involvement with Captain Marvel's conception, and in fact has voiced an intense dislike for the character and especially his original white-and-green costume: "It was awful – just an imitation of any of the other costumed characters I'd ever done." Shortly thereafter, Captain Marvel was given his own series, commencing with Captain Marvel #1 (May 1968). 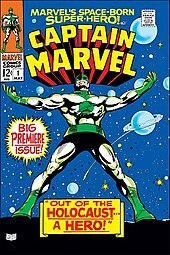 These appearances established Captain Marvel, or "Mar-Vell", as an alien of the Kree race who had come to earth as a spy before coming to identify with his human neighbors. The series failed to register with readers, and was revamped by writer-artist team Roy Thomas and Gil Kane in issue #17 (October 1969). The character was given a new uniform, designed by Kane and colorist Michelle Robinson, and greater abilities. An added plot feature was the introduction of sidekick Rick Jones. Jones and Marvel "shared molecules" allowing only one to exist in the real world at a time. Thomas stated that the intent of the change was to create a more science-fiction oriented update that was reminiscent of Fawcett Comics's original Captain Marvel, who similarly had an alter-ego that could not co-exist with the superhero. The change, however, was not successful, and the series was published only intermittently from 1969. It was initially canceled with issue #21 (August 1970), though the character appeared in the Kree-Skrull War storyline in Avengers #89 – 97 (June 1971 – March 1972), also written by Thomas. The Captain Marvel series recommenced with issue #22 (September 1972). Plotter and artist Jim Starlin decided to revamp the character with issue #25 (March 1973). Comics historian Les Daniels noted that "In a brief stint with Marvel, which included work on two characters [Captain Marvel and Adam Warlock] that had previously never quite made their mark, Starlin managed to build a considerable cult following." A spin-off series, Ms. Marvel, was launched in 1977, but sales remained modest, and the series was published on only a bimonthly basis until it was ultimately canceled in 1979. The continued publication, however, kept the trademark current. This had the effect of requiring DC Comics, which in the meantime licensed the original Fawcett Captain Marvel for publication, to print its new comics under the trademark Shazam! Comics historian Don Markstein states, "Marvel didn't seem to quite know what to do with him—but they did put his comic out every other month through most of the 1970s, if only to maintain their trademark on his name." When Captain Marvel was cancelled with issue #62 (May 1979), there were five as-yet unpublished issues already complete or near-complete. The series Marvel Spotlight was revived for the express purpose of publishing them (specifically, in issues #1-4 and 8). Starlin wrote Mar-Vell's death in Marvel's first graphic novel, The Death of Captain Marvel (1982). Following the character's death, Marvel published several comics with new characters taking up the "Captain Marvel" moniker, thereby maintaining their trademark on the name. The character returned, although not in a living capacity, in storylines in Silver Surfer vol. 3 #63 (March 1992) and Captain Marvel vol. 5, #5 (March 2003). The limited series Captain Marvel vol. 6, #1–5 (January–June 2008) was released as part of the 2008 "Secret Invasion" storyline and supposedly heralded the return of the character, although it was eventually revealed that this "Mar-Vell" was an alien Skrull. Mar-Vell was one of the featured characters in the 2011 three-issue limited series Chaos War: Dead Avengers. After the Kree's first encounter with humans, Captain Mar-Vell is sent to spy on Earth and decide if it is a threat to the Kree empire. He adopts the identity of a recently deceased scientist named Walter Lawson, but occasionally dons his Kree military uniform to protect the people he's observing. The first time he does this, people hear him incorrectly pronounce his name as "Captain Marvel". His job is made difficult by his jealous commanding officer, Colonel Yon-Rogg, his growing affection for humanity, and his fake identity's criminal past. After aiding humanity several times, Mar-Vell is found guilty of treason against the Kree Empire and sentenced to death by firing squad. Mar-Vell escapes in a stolen rocket, but becomes lost in space. After drifting for 112 days, he is weak and on the verge of madness. He is manipulated by Ronan the Accuser and Kree Minister Zarek into helping them overthrow the Supreme Intelligence. To better help them, Mar-Vell is given a new costume and enhanced abilities. After the conspiracy is foiled, Mar-Vell tries to return to Earth. On the way, he is hit by a blast of radiation that traps him in the Negative Zone. The Supreme Intelligence enables Mar-Vell to telepathically contact Rick Jones, which he uses to lead Jones to a set of "nega-bands" at an abandoned Kree base. When Jones puts on the bands and strikes them together, he trades places with Mar-Vell and is encased in a protective aura in the Negative Zone. The pair discover they are able to maintain telepathic contact. Using this method, Mar-Vell can remain in the positive universe for a period of three hours. After brief encounters with the villain Scorpio and the Hulk Jones uses Mister Fantastic's portal to the Negative Zone to free Mar-Vell, who then becomes embroiled in the Kree-Skrull War. As a result of the war, Jones was left near death and Mar-Vell re-merged with Jones in order to save his life. Mar-Vell's consciousness began to resurface weeks later as Jones's body became unable to house both his own and Mar-Vell's life energy. Photon ray treatments by a Professor Savannah stabilized the situation and brought Mar-Vell's body and consciousness to the surface. After battling the atomic-powered Megaton, Mar-Vell is trapped in the Negative Zone once again until released by Jones via the nega-bands. Mar-Vell aids the Avengers against the Grim Reaper and the Space Phantom. Mar-Vell allies himself with Mentor and Eros against the death worshipper Thanos and his forces in a war for the Cosmic Cube. Seeing the magnitude of the threat, the cosmic entity Kronos aids them by creating Drax the Destroyer, whose sole purpose is to kill Thanos. Another cosmic being, Eon, transforms Mar-Vell into the "Protector of the Universe". This provides the hero with new abilities, including "cosmic awareness". Thanos gains the Cube and uses it to make himself omnipotent. Thanos' spirit leaves his body, and Mar-Vell uses the opportunity to shatter the Cube, which was still in Thanos' hand. This undoes Thanos's actions. Mar-Vell teams with Spider-Man to battle the Basilisk and later encounters a new villain named Nitro. While defusing a bomb placed by Nitro, Mar-Vell is exposed to a powerful nerve gas called "Compound 13". Mar-Vell collapses due to the exposure, but recovers when given an antidote. The gas, however, would eventually prove to be carcinogenic and cause Mar-Vell to develop cancer. During this time, Mar-Vell has an encounter with Living Laser. Mar-Vell investigates Nitro's allies, who are revealed to be the Kree "Lunatic Legion", leading to a series of protracted battles and the eventual trial of the cosmic entity Uatu the Watcher for constant involvement in Earth's affairs. After ending the threat and aiding Uatu the Watcher, Mar-Vell briefly separates from Jones and has an encounter with a space parasite that assumes the form of former lover Una. Mar-Vell travels to the Kree homeworld of Hala, and through a protracted series of events that almost kills Rick Jones, frees himself from the manipulation of the Supreme Intelligence. During this period Mar-Vell also encounters the cosmic entity the Stranger. Returning to Earth, Mar-Vell encounters stranded Kree scientists who attempt to retrieve an inactive Kree Sentry located on the S.H.I.E.L.D. Helicarrier. This proves unsuccessful when the Sentry activates but fails to follow direction, going on a rampage. A new villain called the Cheetah attempts to manipulate the Sentry, although both are eventually defeated by Mar-Vell. The hero locates the Kree scientists, and briefly battles Ronan the Accuser, who was left with the mind of a child after a previous encounter. Rick Jones is visiting Avengers Mansion when the robotic villain the Super-Adaptoid attacks. During a battle with the Avengers, Jones trades places with Mar-Vell, with the Super-Adaptoid eventually mimicking Mar-Vell's Nega-Bands. Mar-Vell then brings the Super-Adaptoid's pseudo bands together, exiling the robot to the Negative Zone and freeing Jones. Mar-Vell bids Jones farewell and encounters Mercurio the 4-D Man, who tricks Mar-Vell into returning to his home dimension, hoping to coerce the hero into building the Omni-Wave Projector. Mar-Vell, however, defeats Mercurio and returns to Earth. Mar-Vell continues to have dealings with the Kree, preventing scientist Doctor Minerva from killing Rick Jones and battling High Council member Phae-Dor before travelling to Hala and, with King of the Inhumans Blackagar Boltagon ("Black Bolt") as his ally, preventing the "War of the Three Galaxies" by exposing a Skrull infiltrator. After another encounter with Nitro, Mar-Vell briefly attempts to adopt the Walter Lawson identity once again and works at an observatory. This plan is abandoned when forced to become Mar-Vell to stop an energy vampire named "Deathgrip". After an encounter with the Thunder God Thor, Mar-Vell is forced to fight off Drax, who has been driven insane due to being unable to fulfill his purpose and kill Thanos. Eventually convincing Drax to aid him, Mar-Vell enters into a war against ISAAC, the sentient computer that served Thanos and now directs his forces. After a series of protracted battles, Mar-Vell convinces ISAAC's female minion Elysius to join him, causing her to fall in love with Mar-Vell; he subsequently defeats ISAAC's other pawns Chaos and Tarterus and the warrior Stellarax on Earth. Mar-Vell eventually defeats ISAAC by entering the supercomputer's programming and forcing it to experience life. Mar-Vell meets Eon once again and reflects on the events of recent times. 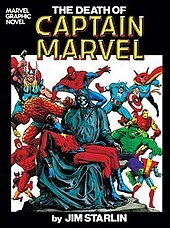 The Death of Captain Marvel graphic novel (1982). Cover art by Jim Starlin. After a battle in the mystical "Dark Dimension"; an encounter with the Hulk and an adventure on an alien world, Mar-Vell discovers that his past exposure to the "Compound 13" nerve gas has given him cancer. Compounding the problem are Mar-Vell's nega-bands, which keep the cancer at bay but also cause it to resist all known forms of treatment, and lack of access to the Kree Empire's medical experts since the Kree consider Mar-Vell a traitor. As Mar-Vell accepts that his life is ending, many of his friends and allies come to Titan to pay their last respects. Even his mortal enemies the Skrulls send an envoy to bestow a medal on Mar-Vell to honor him as their greatest foe. In his final moments, Mar-Vell experiences a vision in which he meets Thanos once again. Thanos has come not as a foe, but as a guide to show Mar-Vell the path to the afterlife as a mark of respect to his greatest foe, giving Mar-Vell an illusion of a final struggle so that he can die fighting rather than in a bed. As he, Thanos, and Mistress Death pass into a blinding light, Mar-Vell dies. His spirit is later called forth by the Grandmaster as a part of the Legion of the Unliving to battle the Avengers. When the Silver Surfer visits the Realm of the Dead, the character is counselled and aided in his escape by someone who appears to be Mar-Vell but is later revealed to be a manifestation of the selfless heroic ideal that is part of the Surfer's own psyche. Mar-Vell's former lover Elysius also impregnates herself with his genetic information, giving birth to a son, Genis-Vell. When Death declares Thanos to be forever barred from her realm and that she will never love him, Thanos uses the Reality Gem to restore Mar-Vell. They discuss Thanos' ability to make Death love him with the Reality Gem, and Mar-Vell convinces him not to do it. Thanos agrees, and returns Mar-Vell to death. Visiting the Realm of the Dead, Genis encounters his father. He learns Elysius also gave birth to a girl, Phyla-Vell. The Young Avengers member Hulkling is revealed to be the child of Mar-Vell and Princess Anelle of the Skrulls. During the war with the Chaos King, Mar-Vell and several deceased members of the Avengers return from the dead. He takes leadership of the group, helping protect several civilians and the comatose bodies of the main Avengers from chaos demons. He is impaled from behind by the Grim Reaper and is killed once more. Some time later, Kree mystics resurrect Mar-Vell using a piece of the M'Kraan Crystal and a portion of the Phoenix Force. Controlling his mind, they use Captain Marvel against the Avengers. The Vision frees Mar-Vell, who sacrifices himself to save the Kree from the Phoenix Force, which threatens Hala when it seeks to reclaim its missing energy. Upon his arrival on Earth, Mar-Vell possessed no superpowers apart from being stronger and more durable than most humans due to his advanced Kree physiology; the Kree have evolved with higher physical-strength levels than humans to combat the heavier gravitations of their home planets. As a soldier, the character is equipped with a device called a "universal beam" (or "uni-beam"), at first a handheld pistol but later converted into a wrist-mounted device that is capable of projecting energy; emitting beams of pure blackness and controlling magnetism. When manipulated by "Zo" (actually Zarek, the Kree Imperial Minister), Mar-Vell had been greatly enhanced, having his physical abilities augmented to the point of crushing the hardest substance known to the Kree, gaining the ability to teleport to anywhere in the universe, fly under his own power at faster-than-light speeds and traverse vast interstellar and intergalactic distances, as well as the ability to mentally project illusions. Most of these abilities were lost when Mar-Vell gained the Nega-Bands, which convert Mar-Vell's psionic energy into greater strength, durability, speed, flight and enable him to exist unprotected in deep outer space without having to breathe. Following the photon ray treatments, Mar-Vell was able to absorb solar energy to further increase his strength. After his encounter with Eon he began to use his solar energy to fly, leaving a sparkling trail in his wake. Once he is named the "Protector of the Universe" by Eon, Mar-Vell gains "cosmic awareness", which (among other things) allows him to detect threats and perceive changes in the universe as long as they are important to him for some reason. This awareness can also be used internally, which alerted him to his terminal cancer even before he went to have it medically confirmed. Mar-Vell's Kree military training gives him mastery of all forms of unarmed combat and extensive knowledge of the technology of the Kree Empire. Basilisk - A petty thief who is transformed by a Kree artifact called the Alpha Stone. Cheetah - A cat-themed revolutionary. Controller - A supervillain who uses mind-control disks. Doctor Minerva - A Kree geneticist. Grim Reaper - A scythe-wielding villain. ISAAC - A computer system. Kree Sentry - A giant humanoid robot created by the Kree. This was Captain Marvel's first opponent on Earth. Living Laser - A laser-themed supervillain. Mercurio the 4-D Man - An alien from the planet Gramos. Nitro - An explosive supervillain. Ronan the Accuser - A Kree accuser. Space Phantom - A race of aliens who work for Immortus. Super-Adaptoid - A robot that can copy the powers of anyone. Super-Skrull - A Skrull with the powers of the Fantastic Four. Supreme Intelligence - A collective of the greatest Kree minds in history. Thanos - A villain from Titan. Yon-Rogg - A Kree commander. The Ultimate Marvel miniseries Ultimate Secret features a version of the character called Mahr Vehl, who aids Earth's heroes against the threat of Gah Lak Tus. In the Earth X miniseries, Mar-Vell is reincarnated as the child of synthetic beings Him (Adam Warlock) and Her. In The Thanos Imperative, the main antagonist is Lord Mar-Vell, an evil being from the "Cancerverse", a monstrous universe in which nothing can die. As such, all life has become cancerous undying beings, desperate to find a new universe to infect. In Warren Ellis's Ruins, reporter Phil Sheldon travels across a version of the Marvel Universe where everything went wrong. In Nevada, he visits America's Kree Concentration Camp, placed deliberately at the site of America's early nuclear projects resulting in all the Kree developing cancer from the radiation. Sheldon interviews Mar-Vell, who was aboard the Kree spaceships that were sent to "liberate" Earth. Their cloaking arrays were deactivated when reacting to the radiation emitting from the mutilated corpse of the Silver Surfer, and as a result were exposed to the Earth. Working in unison, the Earth governments bombarded the ships with nuclear missiles killing nine-tenths of all Kree aboard the ships, the survivors of which were locked in the Nevada camp. The few children born alive at the camp are not told of their elder's failures. Mar-Vell, who had previously argued against the invasion, now regards humans with complete and utter hatred, calling them "retarded little pink monkeys", and has now lost all respect from his fellow species for standing for earth's self-determination. Captain Marvel appears in The Super Hero Squad Show two-part episode "Another Order of Evil", voiced by Ty Burrell. He is established as Ms. Marvel's boyfriend. Mar-Vell appears in The Avengers: Earth's Mightiest Heroes episodes "459", "Welcome to the Kree Empire", "Assault on 42", "Operation: Galactic Storm", and "Live Kree or Die", voiced by Roger Craig Smith. In this story, he is a xenobiologist who comes to Earth to investigate a genetic anomaly, pretending to be a human named Philip Lawson but became intrigued by humanity, and fell in love with Carol Danvers. When a Kree robot comes to evaluate Earth's threat to the Kree, he sacrifices his false identity to save Carol, Wasp and Ant-Man, and in doing so accidentally imprints some Kree powers to Carol. After he and the Avengers neutralize the Supreme Intelligence, Mar-Vell becomes the new leader of the Kree. A re-imagined version of Mar-Vell portrayed by Annette Bening appears in Captain Marvel (2019). A Kree scientist who rejected her species' war with the Skrulls, Mar-Vell fled to Earth in the 1980s and adopted the alias of Dr. Wendy Lawson, a physicist at Project Pegasus. Using the Tesseract, she sought to develop an experimental engine that would have allowed the Skrulls to settle beyond the reach of the Kree Empire. She is killed by Yon-Rogg, though she is able to instruct Carol Danvers to destroy the engine before he is able to seize it. Captain Marvel is a playable character in Marvel Super Hero Squad Online. Captain Marvel is a playable character in the PSP version of Marvel: Ultimate Alliance. Mar-Vell is playable as an enhanced costume for the Ms. Marvel character in Marvel Heroes. ^ a b "The Top 50 Avengers". IGN. April 30, 2012. Archived from the original on April 21, 2016. Retrieved July 28, 2015. ^ a b c d e f Markstein, Don (2010). "Captain Marvel (1967)". Don Markstein's Toonopedia. Archived from the original on April 9, 2012. Retrieved August 30, 2010. ^ Markstein, Don (2010). "Captain Marvel (1966)". Don Markstein's Toonopedia. Archived from the original on April 9, 2012. Retrieved August 30, 2010. ^ Reed, Tucker (October 3, 2017). Slugfest : inside the epic fifty-year battle between Marvel and DC (First ed.). New York, NY. ISBN 978-0306825477. OCLC 972386162. ^ Field, Tom (2005). Secrets in the Shadows: The Art & Life of Gene Colan. Raleigh, North Carolina: TwoMorrows Publishing. p. 78. ISBN 978-1893905450. ^ a b DeFalco "1960s" in Gilbert (2008), p. 138: "Rick Jones...became bonded to Captain Mar-Vell thanks to Roy Thomas and artist Gil Kane." ^ Herman, Daniel (2002). Gil Kane: Art and Interviews. New Castle, Pennsylvania: Hermes Press. p. 200. ISBN 978-0971031166. ^ a b c Sanderson, Peter "1970s" in Gilbert (2008), p. 159: "In March , the first of artist Jim Starlin's many sagas of the Marvel heroes' wars against Thanos began." ^ Daniels, Les (1991). Marvel: Five Fabulous Decades of the World's Greatest Comics. New York, New York: Harry N. Abrams. p. 162. ISBN 9780810938212. ^ Markstein, Don (2010). "Captain Marvel (1940)". Don Markstein's Toonopedia. Archived from the original on April 9, 2012. Retrieved August 30, 2010. ^ Buttery, Jarrod (April 2014). "Ready for the Spotlight". Back Issue!. Raleigh, North Carolina: TwoMorrows Publishing (71): 11. ^ a b DeFalco "1980s" in Gilbert (2008), p. 207: "This title by Jim Starlin was the first of a new series of Marvel Graphic Novels. Running between forty-eight and ninety-six pages, these paperback books were an attempt to compete with the European-style graphic albums." ^ Thomas, Roy; Buscema, Sal; Adams, Neal; Buscema, John (2000). Avengers: The Kree-Skrull War. Marvel Comics. p. 208. ISBN 978-0785107453. ^ Captain Marvel #28. Marvel Comics. ^ Captain Marvel #2. Marvel Comics. ^ "Annette Bening's Captain Marvel role was originally written for a man". Entertainment Weekly. March 11, 2019. Retrieved March 12, 2019.